Many people have bite problems. Sapphire braces is one of the most effective modern solutions to this problem. While the treatment may take some time, it very effectively returns the jaw to the correct position. For most teenagers the treatment is much quicker than the adult bite correction, which may take up to two years. Until recently very few adults were interested in the bite correction to begin with, due to the lack of aesthetics. With the advent of sapphire braces, this problem has completely lost its relevance. Sapphire braces are made of artificially grown sapphires, which, despite their unnatural origin, do not cause any allergic reactions, nor enter into any chemical reactions. In order to make sapphire braces, the alumina billet is heated to 2000 degrees, then it is rapidly cooled and polished. As a result, we get a completely transparent material that adjusts to the color of the tooth enamel. Aesthetic bracket systems that we use in our clinic in the center of Barcelona consist of a metal arch and brackets themselves, with special attachments. The number of braces is determined by the number of teeth that need to be moved. 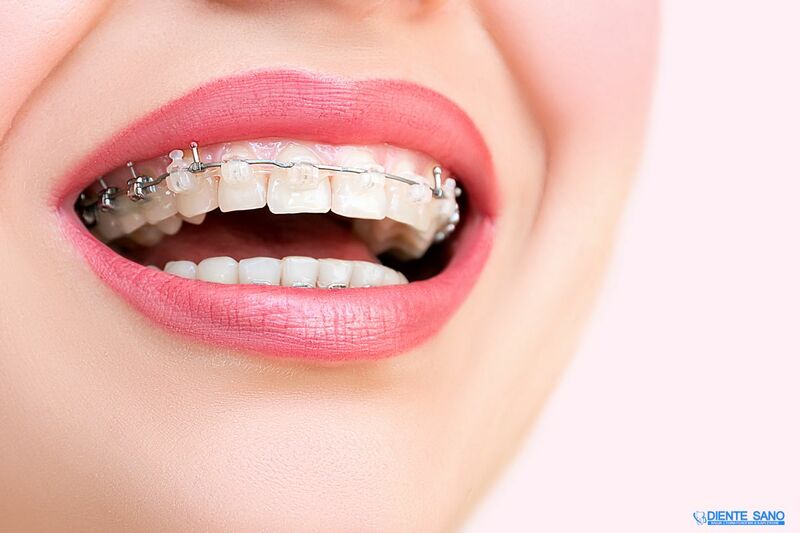 The principle behind orthodontic treatment is based on the ability of teeth to slightly change their position under the influence of pressure. Sapphire bracket systems use metal arches with a “memory effect”. These arches constantly strive to get back into their natural shape, thus, they continuously apply gentle pressure on improperly positioned teeth. If the patient only has minor abnormalities in the jaw structure, there is absolutely no need for the intermediate visits to the dentist to tighten the bracket system. Bite correction will occur automatically. As for the shortcomings of sapphire braces, they are almost nonexistent. Probably the biggest one of them is the high cost, which is caused by the production complexity. Some patients are not completely happy with a long treatment period, which can only be reduced by increasing the pressure on the teeth and does not always lead to good results. Another thing to consider when installing sapphire braces is their fragility. For the system to complete the task, it must be treated very carefully. Schedule your first free visit today to learn more about sapphire braces.